Life has become a lot more casual these days—jeans for work, texting instead of calling—but that doesn’t mean there aren’t still rules of etiquette, especially when holiday festivities are involved. If you’re expecting to be a guest this holiday season, make sure you understand the ins and outs of party protocol. Whether you’re going to a cocktail party or formal dinner, find out the 10 things you need to know to avoid offenses or an embarrassing faux pas. 2. Bring a gift…and leave it there! 3. Don’t bring uninvited guests. Whether it’s your significant other, a friend or your dog, bringing an extra guest may just be the biggest mistake a guest can make, says Post. “As for bringing Rover, you don’t know whether it’s a no-pets home; as for bringing an extra friend, you don’t know whether there’s enough food.” Bottom line: Don’t bring anyone—two- or four-legged—unless you’ve talked to your host first. 4. Deliver on promised goods. 6. Try to be outgoing. Even if you don’t know anyone, attempt to be social. It’s a party; you’re supposed to meet new people. “There’s nothing worse than seeing a friend or couple standing in the corner by themselves at a party—it makes me feel obligated to spend more than my fair share of time entertaining them when I need to make my way around the room,” says Heidi from New York City. “Every guest has at least one thing in common—the host/hostess!” Use that idea next time you’re stumped for conversation, and ask guests who they know and how they know them. 7. Don’t be too early…or too late! 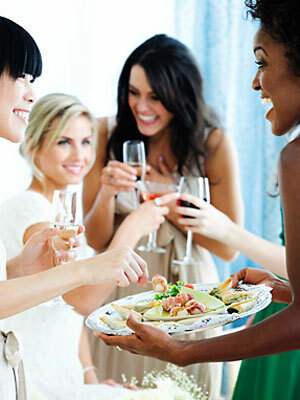 If your host is preparing a formal soirée (like a dinner, engagement or birthday), it’s likely they’ve timed their party prep very precisely—which means showing up early throws off those last precious minutes they need to prep. “I think this is where the term ‘fashionably late’ came from,” says Post. “You want to give the host a little cushion to finish getting ready. Besides, you don’t want to be the first to show up.” Unless it’s a casual cocktail party, it’s equally bad form to be late. “Don’t show up more than 15 minutes after the start time of the party, because then you’re really pushing it,” says Post. 8. Be open to different foods. 9. Say goodbye when you leave. 10. Follow up with a thank-you call or email. This may seem like a no-brainer, but it’s a little more involved than just saying thank you on the way out. “As a guest, it’s really nice to call up your host the next day,” Post advises. “You could even pop a note in the mail, or at the very least send an email.” Not only is it polite, but it really makes your host feel good, and it will help him or her when deciding whom to invite next time!